* Premium 2 Bedroom Apartments are approx. 125 meters in floor size and are double storey apartments with massive lofty 6 metre high ceilings in the living areas and six metre glass walls leading out to an outdoor terrace. R/C Air Con. * Premium 2 Bedroom Apartments enjoy two outdoor terraces, one off the master bedroom, the other off the lounge area. 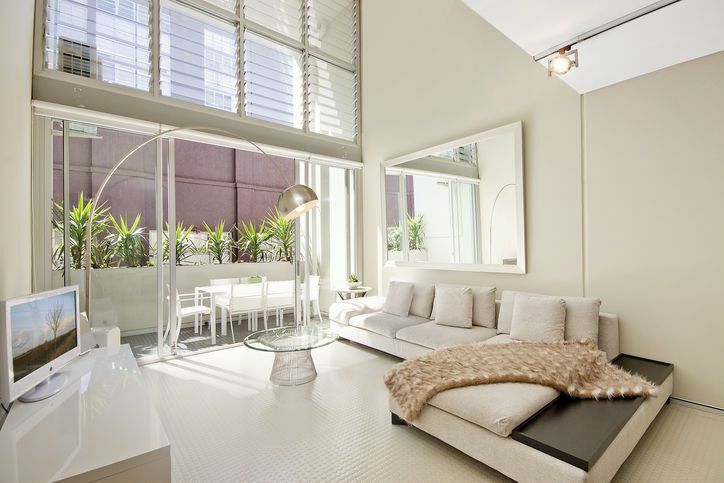 * Master bedrooms are spacious each with king beds which can be separated into two single beds. * Master bedrooms have floor to ceiling, wall to wall glass doors which open out to guests own private extra large terrace retreat, which overlooks Oxford Street. * The second bedrooms are funky loft style, all with double beds and massive built ins. * Premium 2 Bedroom Apartments have two large bathrooms, which are sleek and stylish, the ensuite with full bathtub and shower, and the main with double size shower. All bathrooms are equipped with hairdryers and Molton Brown Bath & Body Products. * Sleek open plan kitchens are full size and fully with all modern appliances including microwave, dishwasher and oven, and they come packed with cooking utensils. * Lounge areas are massive and open plan. Trendy contemporary finishes and beautiful designer furniture, including leather corbusier lounges, barcelona chairs, and ornate mirrors. 27 inch LCD TVs and surround sound home theatre systems are in all Premium Apartments. These residential-style apartments, situated in a boutique complex, are ideal for travelers who appreciate space, style and the convenience of facilities within their apartments, without the services of a hotel. Located right in the hub of cosmopolitan Sydney, this boutique development was recently designed by world-renowned architect Engelen Moore, with a distinctive funky orange facade. True to Engelen Moore's style, the interior foyer and corridors are minimalist industrial, yet the interior of each apartment is a fusion of industrial and contemporary glamour with its large ornate mirrors combined with funky Pirelli rubber stud floors. All furnishings within the apartments are fashionable, contemporary designer pieces. This apartment complex is located in Liverpool Street, next to Hyde Park, and is within walking distance of all major attractions. The apartments are located in the center of Sydney, with shops, restaurants, cafes and transport right on your doorstep, and Sydney's CBD and city attractions all within easy walking distance. *** Located right in the heart of Sydney's bustling inner city precinct, on the cusp of the legal district, beautiful Hyde Park and vibrant Oxford Street. The perfect location for those who require an inner city location, combined with a village atmosphere of the trendy surrounding suburbs. Everything you could possibly need is right at your front door.. 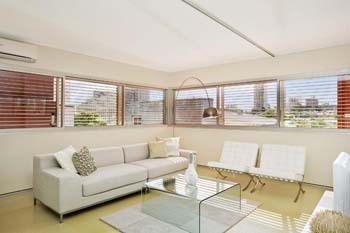 These Sydney apartments has two types of apartment accommodation. Premium 2 Bedroom Apartments, which are funky two bedroom, two bathroom loft style apartments, and the Superior 2 Bedroom Apartments, which are single level apartments, with two bedrooms, one massive bathroom and inner city views. All apartments have FREE High Speed Wi Fi broadband internet, FREE local phone calls and FREE security car parking. *** Every apartment has its own internal laundry with a combined washing machine/dryer, iron and ironing board. All apartments are supplied with linen, towels & soaps for your stay. For all standard bookings: More than 31 days notice a full refund of the deposit is provided. 31-8 days, the deposit is retained as a cancellation fee. Less than 8 days notice, the full amount of the accommodation is charged. Shortening of the booking will forfeit any unused nights, unless agreed otherwise by management All special event bookings cannot be cancelled.